This is an SEM image of a typical Cooper pair splitter. The bar is 1 micrometer. A central superconducting electrode (blue) is connected to two quantum dots engineered in the same single wall carbon nanotube (in purple). Entangled electrons inside the superconductor can be coaxed to move in opposite directions in the nanotube, ending up at separate quantum dots, while remaining entangled. In optical entanglement experiments, a pair of entangled photons may be separated via a beam splitter. Despite their physical separation, the entangled photons continue to act as a single quantum object. A team of physicists from France, Germany and Spain has now performed a solid-state entanglement experiment that uses electrons in a superconductor in place of photons in an optical system. As conventional superconducting materials are cooled, the electrons they conduct entangle to form what are known as Cooper pairs. 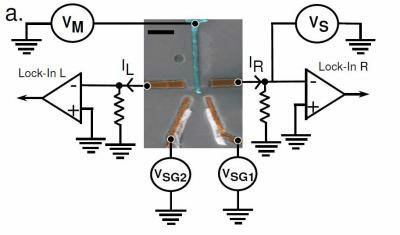 In the new experiment, Cooper pairs flow through a superconducting bridge until they reach a carbon nanotube that acts as the electronic equivalent of a beam splitter. Occasionally, the electrons part ways and are directed to separate quantum dots -- but remain entangled. Although the quantum dots are only a micron or so apart, the distance is large enough to demonstrate entanglement comparable to that seen in optical systems. In addition to the possibility of using entangled electrons in solid-state devices for computing and secure communications, the breakthrough opens a whole new vista on the study of quantum mechanically entangled systems in solid materials.